When looking to invest in a good quality rowing machine you’ll come across a few options, but none will leave quite such an impression on you as the WaterRower. It really is a unique design that is so high end that you’ll be tempted to buy it just for its looks! It is, thankfully, far more than just a good looking machine. It really is an excellent rowing machine. There are a few models in the range but we’re concentrating on just one in this WaterRower Classic review. I hope it helps you to decide whether it’s worth the investment or not. I’m a huge fan of these rowers as you can probably tell. After years of using ugly gym equipment and having it make the house look like crap, it’s such a breath of fresh air to have something that looks quality like this. And then to also have it provide a solid and top end work out, well that transforms it from just a looker to an A1 machine! The WaterRower is based on a simple design and it requires no external power. It will give you an amazing workout and you can burn up to 1000 calories per hour with it. Rowing uses a large proportion of our muscles too so you can be sure it’s giving you a total body workout. The unique selling point of this rowing machine is that it uses water as it’s resistance. It uses the thing that you would use if you were out and about and actually rowing! Fancy that! As you do a stroke with the rower it turns a paddle inside the water chamber at the end of the rower, giving a fantastic swoosh sound (I know, easily pleased!) and natural resistance. What this also means is that it’s a great alternative for if you’re a rower and you can’t get outside to train. It also means that you set the difficulty. The resistance is increased the faster you row, just as it would happen in real life, and is decreased as you slow down. It’s a unique sound as well, the swooshing of the water, and it can prove to be really relaxing and tranquil. A perfect way to start your day! 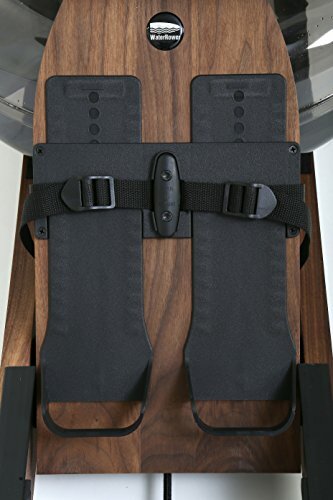 The WaterRower is a US brand and is handmade using black walnut wood. This comes from sustainable sources as well. The looks are a big part of this machine – it’s a talking piece whether it’s out on show and ready to use or even in an upright storage position. It looks good! The walnut finish of the Classic model is the top spec – there are cheaper wood frames that you can go for as well with Ash being the cheapest one. Electric monitor which shows: stroke rate, total strokes, duration, distance (in either metres, kilometres or miles), intensity (in a variety of options – m/s, mph, time/500m, time/2km, watts and calories per hour). As well as giving my own thoughts I really like to check around the internet to get a more rounded idea of what people have said about this rower. The first thing that has to be noted about the Classic WaterRower is that it’s featured on the hit American TV series House Of Cards. The main character has the Classic model and it looks amazing as part of his stress relief activity! The main positives about this rowing machine is that it is a simple, yet seriously effective piece of equipment. You get a great workout and that is praised time and time again. 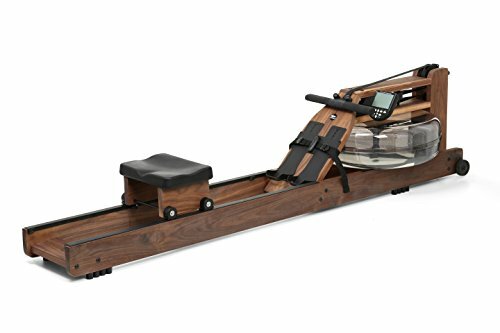 The price is noted, it isn’t a cheap item, but this isn’t a negative for the rower – it is worth the price tag. There are a couple of negatives that do come from the monitor. It’s not particularly easy to set up and although it’s heart rate compatible there is another item you need to pair it up with your monitor. Not great when you’re paying so much. In conclusion the positives of this rower far outweigh the negatives. Even when considering the price you really get an amazing machine that will give you joy each day as you work out and a great workout you’ll get as well. It looks great whether it is in use or stored out the way too and that’s not something you can say about rowing machines very often. If you’re in the market for a luxury and professional rower then you’ll certainly want to be considering the WaterRower.